This week we come at least to the final section of the Aparecida document’s chapter on “The formative itinerary of missionary disciples.” At last we consider where all this should happen. 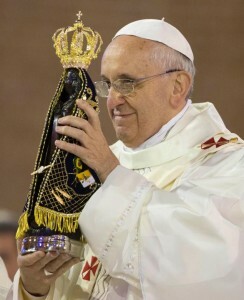 Because I do not think it can be over-emphasized – and I think Aparecida has wanted us to see this – let us one more time say: true formation is always about real encounter with Jesus Christ, leading to constant continuing conversion, discipleship and continued learning, communion in the life of the Church and the local Christian community, and mission to draw others into all of the above. Aparecida’s first answer is, “the family, first school of faith.” Obviously not everyone grows up in a family that can form them as true Christians. But let us all – those with families and those without families – realize that there is no greater maker of saints than a holy Christian family. And why? Because in the family come opportunities for real, daily prayer – not occasional meetings, but day-to-day – along with the day-to-day struggle for conversion. Family makes it real. Let me make an appeal: if in any way we think about marriage without thinking about family as the first school of faith, we fail profoundly. The exclusivity of family – not everyone is part of such a family – should perhaps remind us, too, that formation needs to focus on the particular. Efforts to form absolutely everybody everywhere end in forming no one. We can only form particular people in particular contexts. Is that unfair? It is the reality of the human condition. Let it drive us to mission: to look to work for formation where we can. The parish exists to be a place of formation. What would it mean to make our parish liturgies real places of encounter with Christ? But what could we do, too, to make them places of personal conversion, life-long discipleship, and communion? And places from which we launch out into mission? The “new movements” exist to complement the parishes, to pick up where parishes fall short. But let them not replace the parishes, which are natural places of encounter, closer to the reality of family. And let both parishes and big movements encourage us to think about small communities: all the little ways we can gather together, in various ways in various places, to live the faith more deeply. These forms of communion and encounter are necessary! Finally, Aparecida speaks of schools: seminaries, houses of religious formation, Catholic schools, and universities. Here perhaps I am preaching to the choir, but let us not forget that this is the real purpose of these institutions, the reason they exist: so that as we give people other skills, we also form them as Christians. Let us consider, then, too, the importance of these institutions. What opportunities for formation are lost when we give up on our educational institutions? Now, in all of these places we may still ask, how? How, in any of these places, can we bring people to true formation as Christians? The heart of the answer, I think, is in relationship: our relationship with the truth, and our relationship with one another. These “places” all remind us that true formation can only happen where people are in real contact, whether it is the more natural contact of families and parishes, the explicitly formative contact of small ecclesial communities and big ecclesial movements, or the explicitly educational contact of seminaries and schools. Perhaps I should point out that Web pages and blogs don’t make Aparecida’s list. Reading is an important part of formation. But real formation means praying together, living together, struggling forward together. It requires true human contact. Let our internet outreach never falsify formation by reducing it to just one element. Because the other side of formation is our relationship with the truth: the truth of integral formation. How do we form others in the Christian life? By pursuing it ourselves, in its integrity. By never forgetting that it must be always about encounter with Christ, conversion, discipleship, communion with others, and mission. But perhaps the last word that must be said about formation is that there is no last word. Once we bring people into contact in the context of real, integral, Christian formation, there is no single answer. The answer is in relationships. It is in creativity. And it is in a passionate thirst for our own formation, and to share deeper formation with others. What could we do to promote formation in our parish?